If your Newscoop server is hosted by Sourcefabric, routine backups and upgrades will be taken care of by the Newscoop team, so you do not need to read this chapter. Before upgrading your own server to the latest version of Newscoop, it is strongly recommended that you back up your publication database, theme templates, images, file attachments and configuration files. First, log in to the administration interface (see the Getting started chapter in this manual for details). Click on Actions in the main navigation menu. At the lower end of this sub-menu, click Backup/Restore. On the Backup/Restore page which opens, click the Make new backup link next to the blue plus icon. A dialog box will ask you if you are sure you want to make the backup. Click the OK button, and a pop-up window will display the progress of the backup. Once the window reports Backup saved to file: you can click the Close link to return to the Newscoop administration interface. On the Backup/Restore page, the backup you just made should be listed, together with any previous backups. Click on the disk icon in the Download column to save the gzipped backup tarball (with the .tar.gz file extension) from your Newscoop server to your desktop computer. To restore from a previous backup file into another Newscoop system, click the Upload backup file link, and then select the backup from your desktop computer's file system with the Browse buton. Then, click the life preserver icon to restore from one of the listed backups. You will be warned that current publication and theme data will be overwritten by versions in the backup file, so you should make sure you have a backup of current data before continuing. When moving Newscoop data between servers, you may have to change the default publication alias to match a new domain name. 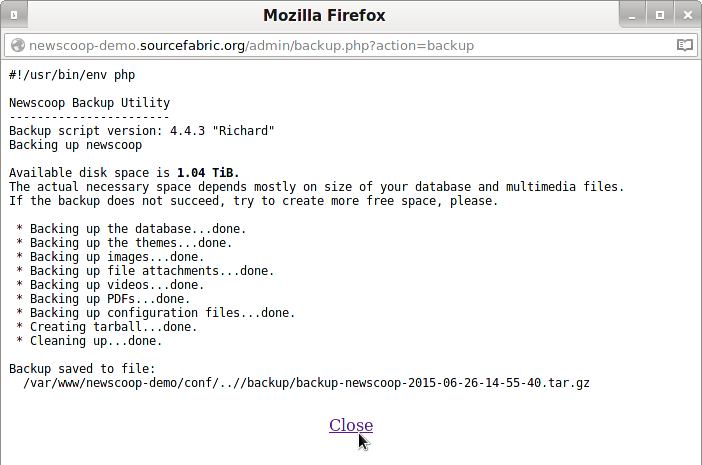 Backup script version: 4.4.4 "Richard"
* Removing files in /var/www/newscoop/themes...done. * Removing files in /var/www/newscoop/images...done. * Removing files in /var/www/newscoop/public/files...done. * Removing files in /var/www/newscoop/cache...done. * Removing files in /var/www/newscoop/public/pdf...done. * Removing files in /var/www/newscoop/public/videos...done. * Upgrading the database from version 4.4.x, roll 2015.05.16...done. [-t destination_database_name] If provided, the script will use the database name specified instead of the one specified in the backup file. This is useful for transfer of a Newscoop publication to another server, where database names may be different. [-e] Use the existing configuration files instead of the ones in the backup file. The existing configuration files in the current installation will not be replaced. This argument takes precedence over the -t argument; if both arguments are used together, the database name will be read from the existing database configuration file, not from the -t argument. [-c charset] Convert the data from charset to UTF-8. [-s] Convert the data from the database server character set to UTF-8. [-l] List all available character sets and exit. [-f] Don't prompt, assume 'yes' to questions. 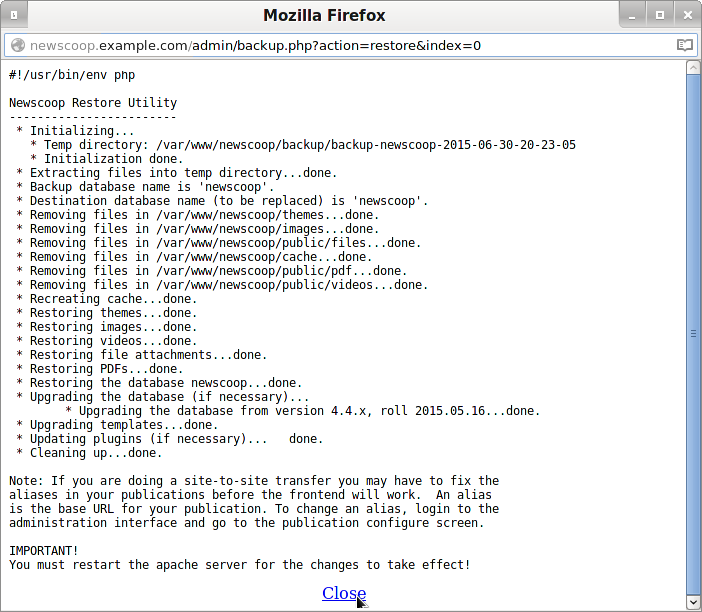 The newscoop-restore script will replace all existing data with the contents of the backup archive. You must run the script from a directory that you have write access to, because this script needs to create a temporary directory. Note that your backup database and files will automatically be upgraded if they are older than the currently installed version of Newscoop. Finally, restart Apache as suggested by the message from the newscoop-restore script. With multiple installations of Newscoop on a single server, you must run the newscoop-restore script from the installation where you want to restore the matching data. For example, you may have installed Newscoop in two locations, /var/www/newscoop1 and /var/www/newscoop2. To restore the data for the newscoop1 installation, you must run /var/www/newscoop1/bin/newscoop-restore rather than the /var/www/newscoop2/bin/newscoop-restore script. After you have completed the backup successfully, you can upgrade Newscoop using the full tarball or zip file package, or git, as shown in the Manual installation method. The existing files in the Apache DocumentRoot folder (such as /var/www/newscoop/) should not be removed first, unless you wish to perform a clean install. Any changes that you have made to the sample themes supplied with Newscoop may be overwritten on upgrade. For this reason, you should rename the sample theme in the theme.xml file before upgrade and keep a backup copy, if you wish to keep those changes. See the Newscoop Cookbook technical manual for more details on how to create themes. 1. Take the site offline using System Preferences on the Configure menu of the adminstration interface, so that a maintenance message will be displayed to your readers. 2. Only if you are using the full install package to upgrade, remove the /var/www/newscoop/vendor directory. (You do not need to remove this directory when using the update package). Check if there are any instructions in the output of the upgrade script, and if so, follow these extra steps. Once the upgrade is complete, your publications should be put back online using the administration interface.